Locksmiths can help you in many of ways, should you require your door unlocking, key cutting or changing your locks. Some locksmiths, like Lock Solutions, can also be available for assistance 24 hours a day. At Lock Solutions we provide a selection of locksmith services including 24/7 services, key cutting and other security services. WHEN SHOULD I CALL A LOCKSMITH OUT? There’s a number of reasons you may need to call a locksmith out, here we’ll outline some of the main problems you may require locksmiths services. Are you locked out of your home? If you are and you have no means of getting inside, then locksmiths can be very beneficial, give our locksmith a call if you cant get in into your home and we can help. Have you lost your keys? This can be disastrous is they fall into the wrong hands, should you lose your keys then we suggest that you get your locks changed, as well as if you’re unable to find your keys, you never know who may have found them. Is a lock at your home broken? It’s vital that you get it replaced, it’s a significant safety risk to you and everyone else in your property. A broken lock is basically a free invitation to enter your home without permissions. If you’re moving into a new home, it’s a good idea to get the locks changed, this is because, although previous tenants should hand back all their keys, they might not. Having the locks changed for your peace of mind is a good idea. If you require more keys for your property, then a locksmith can help. They’re able to take your existing keys and duplicated them as many times as your like. This is great if you are moving in with someone and they require more than one or two keys. At Lock Solutions, we have been working in this industry for a number of years and we’re more than capable of providing assistance should you need it. If you’re looking for professional and skilled locksmiths, look no further, we can be on hand to help. What’s more is we provide a 24 hour locksmith service to make sure that whatever time it is, you’re not stranded without a key to your home. No matter your requirements, whether it’s a simple key duplication of a bigger job such as replacing all the locks in your home, don’t worry, at Lock Solutions we guarantee we can assist you efficiently and effectively. For more information check out our website or give us a call today. Posted on December 14, 2017 November 16, 2018 Categories UncategorizedLeave a comment on HOW CAN A LOCKSMITH HELP ME? Why Should I Have Home Security? There’s a variety of reasons why locksmiths are called out, with some being more common than others. Being a locksmith for a number of years means we have experience in this area, so we have put together some of the main reasons we have come across when it comes to locksmith call outs. The requirement for replacement keys is one of the main reasons why locksmiths are called out, people lose their keys, it happens, we’re only human. But you shouldn’t have to go without just because you’ve lost your key. One of the other reasons that locksmiths are called out is to change locks, this is usually due to loosing your only key or that unfortunately you’re a victim of burglary or your keys have been stolen. By replacing your locks you are preventing potential intruders trying to get into your home. If your lock is broken, you may be unable to enter your home, don’t worry though as Lock Solutions can help. We’ve been called out many times, especially when it comes to repairing the locks of people who’ve fallen victim faulty mechanisms. Or maybe your keys are still working but it’s taking a long time to unlock your door. Well don’t worry, Lock Solutions can be on hand to help. Being locked out of your home or property can be annoying, all locksmiths have experienced being called out to a property where the resident has been locked out or has locked themselves out. It’s not unusual and can happen at any time which is why we are always on call to help 24 hours a day. The team at Lock Solutions understand the importance of being able to get inside your home, this is why we offer a 24 hour emergency locksmith service to anyone who may need it. We understand the hassle of these situations and the problems it can bring to customers which is why we only provide quality products and services. We want to make sure that our customers are satisfied with the service they receive from us, if you are interested in the services we provide, feel free to take a look at the rest of our website. Alternatively, get in touch with us directly and one of our team will be happy to take your call and assist you in any way they can. At Lock Solutions we have years of skills and experience when it comes to being reliable and reputable locksmiths. What’s more is we also have an outstanding customer base and reputation in Reading, Berkshire and the Thames Valley. No matter what your requirements or location are, our locksmiths will be there promptly, ensuring your situation is dealt with in a timely and sufficient manner. Not only that, we’ve been working within this area for so long, that we’re known as the locksmith of choice for a large number of people, allowing us to grow and expand a little more every day. We provide a vast range of services to make sure we meet the needs of all of our clients. From an emergency locksmith to installing your CCTV, Lock Solution’s will be with you regardless of your requirements. We believe that our team of expert locksmiths should be the first port of call should you seek a professional and honest security service across Thames Valley. Waste no time or money in going elsewhere for your security needs, be sure to make Lock Solutions your first choice! We always aim to be with you ASAP, 30 minutes in fact! 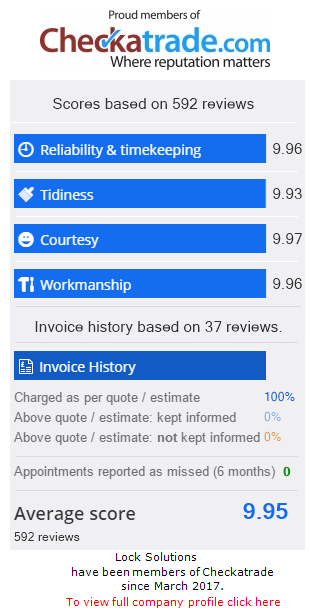 Our reputation alone is great reassurance that we are the locksmiths you can count on! Our team will always be with you no matter what it is you require, even the time of day doesn’t deter Lock Solution’s! So for a reliable, speeding and reputable locksmith and security services in Reading, Berkshire and Thames Valley, look no further, call us today! We’re always looking for new ways to increase security. From businesses to homes, your security is our priority. To help ensure that you feel safe in your property, Lock Solutions have some outdoor security tips. We hope that this advice shows you a few ways on how to protect both your valuables, property, and family. By completing these simple tips, you are putting yourself at less risk of getting burgled. This of course, is our main goal; to keep you safe and secure. Your outdoor security is just as important as your indoor security. So, start protecting your valuables and family today by having a read through our outdoor security tips. Here, you will learn some of the methods to put in place to improve your security. This will therefore become a deterrent to any unwanted guests. If they see that you have CCTV and security in place, they’re more likely to go elsewhere. Our advice is there to take into consideration, and become a starting point for yourself. For example, we would suggest having a gate installed to increase the level of access at your home. Then locking away any valuables at night, e.g. car, children’s toys, bikes, scooters etc. This could be done by using a shed or garage to secure them correctly. For more tips and advice on your outdoor security, feel free to give Lock Solutions a call. Our team are on hand to deal with all your security needs and are here to help protect your home. If you need advice on how to increase the outdoor security at your property, Lock Solutions are here to help. With years of experience behind us, our team are here to take care of all your security needs. From key cutting to CCTV installations, Lock Solutions are at your call. Take the first step to upping your outdoor security and contact Lock Solutions for all your security needs in Reading. We can then establish the beneficial methods of security available to increase your current security. For more information on our services or to speak to a member of our team, please contact Lock Solutions. We are here to help you, ensuring that you’re comfortable, happy, and safe in your property. Simply get in touch today, and we will arrange a convenient time to begin your security improvements. For all of your security needs in Reading, look no further than Lock Solutions. Our team are reliable, reputable and more importantly, here to help with all of your security needs. We have been providing our locksmith services in Reading and the surrounding areas for many years now, so regardless of your needs, we’re here to help. Your security is our main priority, so we will give you the solution to your locks and security. The clue is in our name! If the idea of having better home security suits you, contact Lock Solutions to find out how we can help. We have years of experience in this industry and are here to help improve your security for the better. Not only that, day or night, our out of hours locksmiths are on call to help with all of your security needs. For more help and advice on improving your home security, turn to Lock Solutions. We will do our best to improve the quality of your home security, giving you great peace of mind. Start the process of improving your security by contacting the professionals at Lock Solutions to discover more. We will discuss your options for home security and how our systems will benefit you. Contact Lock Solutions today on 01183 360177 or 07711 906667 to find out how we can help with your home security needs in Reading. Posted on August 17, 2017 November 16, 2018 Categories UncategorizedLeave a comment on Why Should I Have Home Security? Are Spare Keys Really Necessary? In short yes! Spare keys are important for everyone to have, whether you leave them with a friend, family member, neighbour or in a secure location, you should have a set of spare keys. Having a spare set of keys means if you leave yours at work or lose them completely you can easily regain access to your property without having to break the lock or damage the door itself. Without a set of spare keys for your property you could end up finding yourself caught off-guard especially if you lose your keys. Having a set of keys means you won’t need your lock replacing to regain access to your property. Spare sets of keys can be left with anyone such as family members, friends, neighbours or even in a secure place such as at work. You can leave your spare keys at various locations meaning you have access to a number of places where you can get your keys from. Key cutting is a service that many locksmiths offer and having a good quality copy of your original keys means your home will still be accessible if your original keys are lost or damaged. Keys can be cut numerous times and some people leave them with a range of people to ensure that they also have access to a spare set should they be needed. If you’re in need of key cutting or if you’ve found yourself without a spare set of keys, then be sure to get in touch with Lock Solutions. Posted on July 24, 2017 November 16, 2018 Categories UncategorizedLeave a comment on Are Spare Keys Really Necessary? Protecting your home and belongings is a concern that many tenants and homeowners worry about. One of the most important things in home security is the locks you choose for your doors. However, there are many different types of locks to choose from. It can be difficult to know which is the best type of lock to choose, locksmiths can provide expert advice on the best type of doors locks to help secure your home. The door and the lock go hand in hand, whilst having a strong lock is important the door itself also need to be sturdy. Deadbolt locks are heavy-duty locks that are separate from the door knob or handle. The deadbolt will usually be positioned so that the bolt pops out of the door and into the wall when it’s latched. This means that when the deadbolt is locked, the door can’t be opened. Deadbolts are tough, but they need to be fitted correctly to ensure they are effective. The strike plate for the deadbolt should also be installed properly to ensure the bolt goes all the way into the hole. If your door can’t use a deadbolt then a keyed lock could be the best option for you. Keyed locks are commonly found on gliding glass doors and patio doors. Original locks that come with sliding doors tend to wear out and not provide the right type of protection for your home. Keyed locks offer the best protection for sliding doors, especially when they are installed at both the top and bottom of the door. One of the newest locks on the market is the electronic lock, which doesn’t require the use of a traditional key. Instead many electronic locks use a code via an entry pad, smartphone or a key fob. This option is seen as a high-tech option and gives your home enhanced security. Electronic locks are becoming more popular, especially on new homes, as they are simply more convenient and you don’t need to worry about losing your keys. Locks that are connected to your phone can provide you with information regarding who and when people are entering your home. Door handle locks are one of the common locks used by people throughout the country. When used in conjunction with options such as deadbolts they can provide a secure locking system. One of the most effective places to use door handle locks is inside the home; this could be on an internal door after your entrance way or on a doorway to the garage. Combination can either be electronic or mechanical. Mechanical combination locks work through either a push in button or twist dial system. Digital combination locks will typically require a password or pin, similar to how a phone works. If you’re in need of new locks, then please don’t hesitate to get in touch with Lock Solutions. We can provide expert advice on the best type of lock to choose for your property. What Types of Business Security Should I Have? Losing your own valuables can be difficult to deal with and get over, but when your business is burgled it’s a whole different ballgame. When a business is burgled it can seriously affect the way in which your business operates such as not having the correct tools or loss of computer equipment and files. Keeping your business secure is important and something that all business owners should do. There are a number of security methods and systems that you can use to create a safer environmental to work from. The ability to control who accesses your property or monitor activity in or around your property is beneficial to most business owners. Whilst having security systems installed can help to protect your property, they can also be a big deterrent for any potential burglars. We regularly recommend a number of security options to our commercial customers to ensure their property is protected in the best possible way. Locks are one of the most simple and common ways to protect your business. Whilst some people will just choose any lock, when it comes to commercial properties it’s important to ensure that it has the right type of lock. There are many different types and brands to choose from, working with a professional commercial locksmith will ensure that your property is fitted with the best type of lock available. Access control systems can be used in conjunction with traditional locks or completely on their own. There are various types of access control systems to choose from code locks, to key fobs and even identify cards. Access controls allow you to not only limit who has access to your property but can also be used to monitor their access. Many systems that use identity cards or key fobs will leave a trace of the day and time they entered or exited a property. CCTV has come on leaps and bounds in recent years and investing in a quality system allows you to have a crystal-clear view of the people of the people in or around your property. Being able to manage and monitor the activity in or around your property, lets you see what employees or visitors are getting up to. Simply having a camera on your property can act as a deterrent to any potential burglars. Security alarms can deter and protect your commercial property against theft and potential intruders. When used in conjunction with glass break detectors, motion sensors or door and window sensors that can trigger the alarm, then it can stop the theft from occurring even if a window or broke is broken in the process. It’s easier to replace a door or window that it is to replace all of your stock, tools or equipment. If you own a business and you’re looking for a professional locksmith to provide you with security for your property, then be sure to get in touch with Lock Solutions. Whether you’re a first-time buyer or you’re simply upgrading to a larger property, then you need to consider whether it’s secure. Although your new home might look great and seem secure, do you really know if you have all the keys. Properties have keys for everything from windows to doors and much more. However, windows and doors need to be secure. You never know who might of previously had access to your property, so it’s important to make sure that the locks are changed especially the door locks. Many people ask why they should change the locks of their new property, but even though people might have trusted other with their keys. You don’t know who has those keys and if they can be trusted. It’s simply a case of, better to be safe than sorry. Using a professional locksmith will ensure that your locks are changed quickly and with quality locks. For many years Lock Solutions have been changing locks for people who have moved into new properties. It isn’t only home owners though; many landlords choose to have the locks changed after tenants have moved out and before new ones move in. This is so previous tenants no longer have access to the property. Even though it might seem like you’ve moved in and the first thing you should do is call a locksmith. However, diving straight in for the call can extend the length of the whole process. There are a number of factors to consider before calling the professional in. Brands – What brands are the current locks? Although many people think locks are universal not all are, so knowing the brand means we can replace it much more quickly as we’ll fit the same style lock. If you’ve just moved into a new property and you’re in need of your locks changing then simply get in touch and we’ll be more than happy to assist. A family faces eviction and will appear in court as a council begins proceedings that could see them evicted from their home of 40 years due to debts caused by the Bedroom Tax, writes Louie Smith. Bill Whitby, 62, and wife Teresa, 59, live with their son and have struggled to pay the rent on their three-bed house since losing their jobs. They blame the subsidy brought in by the Tories for around half of their £900 arrears. The couple get a total of £112 a week in Jobseeker’s Allowance but say it will not cover the rent after their housing benefit was cut by £15 a week. More than 15,000 people in Basildon have been affected by the Bedroom Tax but campaigners say they have little hope of downsizing due to a lack of council homes. Bailiffs must give at least seven days’ notice of their first visit. You do not have to let them in and they are usually not allowed to force entry. If you do not let them in or agree to pay them, they can take things from outside your home such as your car. They are not allowed to enter if only children or vulnerable people are present or between 9pm and 6am. If you let them in but cannot pay, they can take belongings. This cannot include essentials such as clothes, cookers, fridges or furniture. Nor can they take someone else’s property. Before you pay a bailiff, you should ask to see proof of identity and a detailed breakdown of their charges. Get a receipt for proof of payment. Bailiff fees are fixed. In most cases, if you owe less than £1,500, the fees are: £75 when your case is sent to the bailiff, £235 if you ignore a letter from them and they have to visit you and £110 if they have to take your goods and sell them at auction. You have to pay the bailiff for any action they take – such as storing your goods or using a locksmith. If you owe more than £1,500, you will also have to pay a percentage of your debt each time bailiffs visit.